After the craziness of yesterday today’s 15ish km was a walk in the park. A short climb out of Cee and then a pleasant trail that hugged the coast providing plenty of sea views and even a small beach to frolick on. (I refrained from frolicking.. I’m not a huge fan of sand). The weather had threatened rain and sure enough for the first time on my camino I needed my rain jacket.. for about 15 minutes.. I had ended up walking with three others.. Sue with one red leg.. Ingrid with (I assume) two normal coloured legs and Suzy the ridiculously speedy American. We dived into a conveniently placed cafe and had a couple of coffees until the rain stopped. Shortly after, we were back on the path and closing in on Finisterra. Speedy Suzy had a hotel at the start of the town and the rest of us secured the last three beds in a communal dorm sharing with two French women..
Ingrid and Sue went to meet Suzy and grab some food, I decided I would go for a wander but ended up heading up to the lighthouse.. 0.0km… the end of the Camino and the end of the world. I’m kind of glad I walked the last bit alone. I got to the lighthouse and was surrounded by groups of happy travellers.. some had arrived on busses, others like me had walked. I guess for some it was a 50metre walk from the bus, it had taken me two Caminos totalling over 1100km to get here and I have talked with others that have done four maybe five thousand km and not seen their homes for well over a year. It was a strange feeling sat looking out at the sea. No more walking.. I grabbed a glass of wine and sat with my tired feet up while I tried to work out why I felt so empty.. surely I should be happy that I’d made it here? Or maybe I was focusing more on the adventure coming to an end. I sat watching the others come and go. They would sit looking out to sea with the light from the sinking sun illuminating their faces as they chatted to their friends and walking buddies.. I looked at the table where my solitary wine glass rested.. I realised one of the reasons I felt low. There should have been at least three or four more glasses next to mine… This should have been a team tortoise moment. Looking back over the last 7 months was quite a moment.. two pairs of trail-runners worn out.. at least 40litres of cafe con leche.. 80litres of coke… 40 flans (the Portuguese way was quite sparse on the flan front). More “Buen Camino”s than I care to remember… I’d made it without twisting an ankle, breaking anything and only a few blisters.. obviously there was the one dangerous moment only recently where I could have died in an animal attack but some swift pole action and a couple of deft karate moves ended that problem before it got out of hand.. (that mouse will think twice before it rustles near a pilgrim in the future). The sun started to dip toward the sea and who should turn up but Ingrid and crazy legs Sue, (Speedy Suzy was nowhere to be seen) We found ourselves a rock and sat to watch as the sun slowly disappeared off the end of the world. Later that evening I lay in my bed and a thought struck me.. Finisterra is definitely AN end of the world.. but maybe not MY end of the world… There’s got to be lots of others, Maybe I just have to go to the next one and see if that’s mine… I hear the Appalachian Trail is a pleasant walk. I think this chubby non-walker needs to buy another pair of hiking shoes. Congratulations!!! What a wonderful Camino. I think the end of the camino is always much harder than the beginning. You must be very proud of your accomplishments once again! Thank you for sharing your journeys and I am looking forward to your next one. NOTE: Once you do a little research, you will find out that on the AT you may experience more wildlife than a noisy mouse – there are bears, poisonous snakes, coyotes, ticks, spiders, and no yellow arrows or cafe con leche or flan and no wifi. The Caminos in Spain would seem like a walk in the park! BRAVO!!! 1100 is a lot of km, good on you. Are you really still a non-walker? I felt let down when it was over too. For months actually! I still dream of going back, every single day. Whatever you do next will be amazing! Well done Amigo. I shared your sentiment that it would have been great to have Team Tortoise together to celebrate the completion of the journey with you. Watching the sun set across the Atlantic is a bitter sweet moment, a contraction of emotions. The knowledge that you have finished what you set out to do and that those feet and legs really can withstand the constant movement and effort after all. Well done. Remember “Down Under” can be fun. Drop down here some time and you will see a sunset or too. Buen Camino my friend. Well done!!! How about the PCT in 2019??? I’m reminded back to your posts about your original training hikes before your first Camino. You’ve covered an awful lot of ground since then. Inspirational stuff … many thanks for sharing your thoughts, your anecdotes and your pictures. Endings always do seem flat … maybe we just need to live in the middle times; they’re the best! 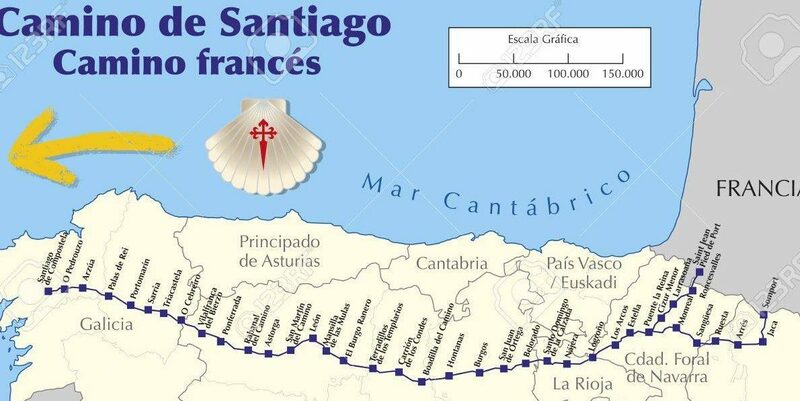 Congratulations, we started our Camino journey at roughly the same time, but you’ve gone and walked from Poerto and then onto Finisterre. I am envious.